Fancy a little spring picnic? This is the one you need. It will travel really well once cold, it is really easy to whip up (especially if you cheat like I did and use the frozen pastry sheets) and serves at least 6, depending on how hungry your bunch is! Get organised with some crusty bread, a nice red, and a big ole salad, get the rug, the paper plates and the family and you are off! Enjoy. Line 1 large or 2 small fluted non-stick tart tins with the pastry. Make joins in the pastry as needed, pressing the pastry together. Sprinkle the speck and onion across the pastry base. Place the Parmesan and cheddar cheeses into Thermomix bowl and mill 10 sec/speed 10. Remove from bowl and set aside. Place eggs, cream cheese, milk and nutmeg into Thermomix bowl and blend 30 sec/speed 8. Add most of the grated cheese and stir through 6 sec/speed 6. Pour the egg mixture on top of the speck and onion. 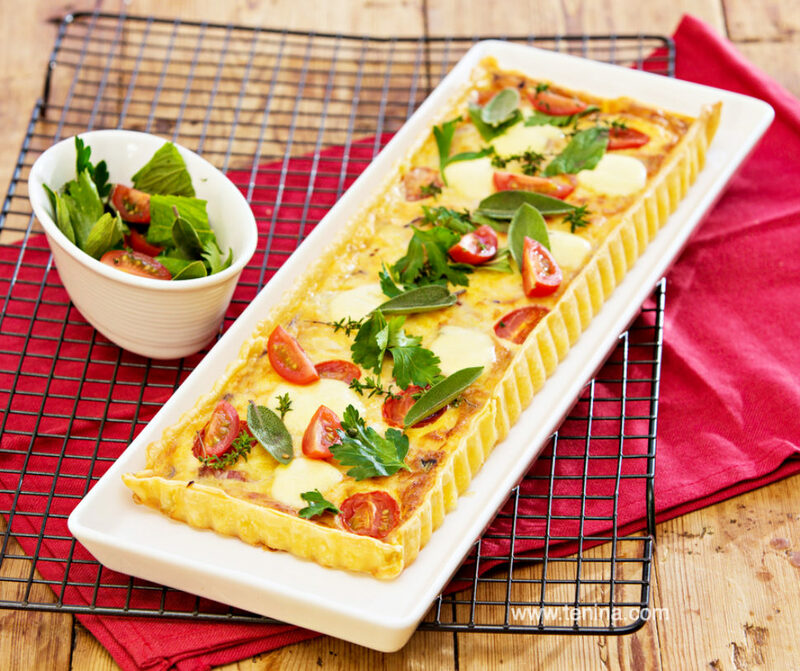 Sprinkle with the remaining cheese, and divide ½ the cut tomatoes across the top of the tart. Bake 30-35 minutes until centre is set and tart is golden. Place the boconccini on top of the cooked tart and return to the oven just until the cheeses start to melt. Serve hot or cold garnished with fresh herbs and the remaining fresh tomatoes.